Wire: 4" Spool x 0.030"/0.035"
20" x 10" x 16"
JEGS Welders make it easy for you to drive right into the world of welding, from the workshop to the basement, to the garage! 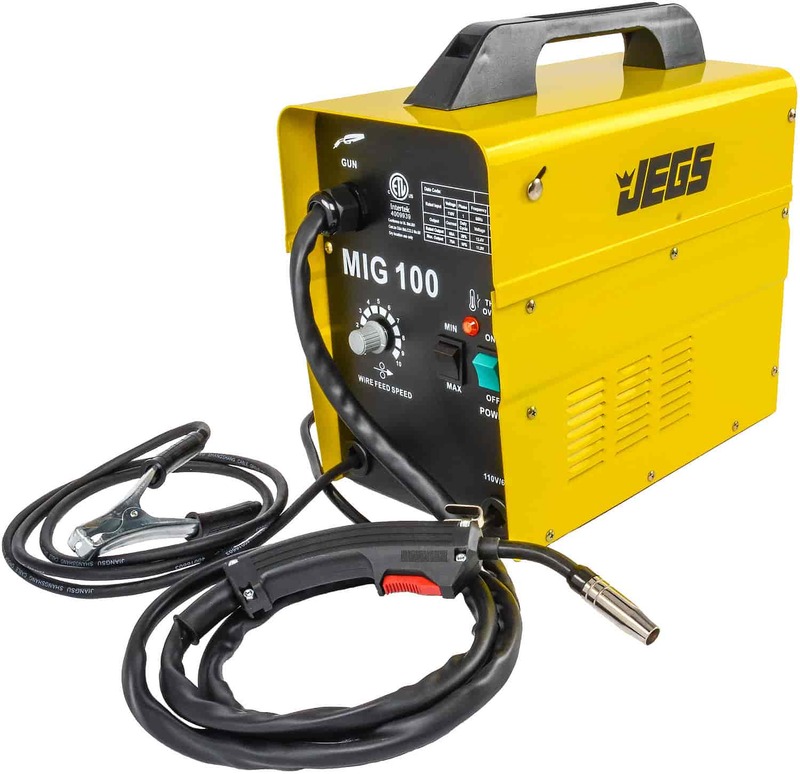 JEGS offers affordable and high-performance MIG and TIG Welders. These welders are suitable for both hobby and professional use. Whether you're a seasoned pro or a newcomer to the welding scene, you'll appreciate the freedom and flexibility of JEGS Welders. With simple controls, these welders make it easy to set up and dial-in your welding project. All welders include a hand-held mask, wire brush, and 1-year warranty; replacement parts available. Get a Welding Cart to store and transport a welder, gas cylinder, welding cables, and accessories. 81540 is rated 4.3 out of 5 by 8. Rated 4 out of 5 by Hardwick from Its a little finicky to set up,But once I figured it out,worked fine! Rated 3 out of 5 by AdmiralJT from I regret buying this I bought this to weld some new floor plans in a beetle and I wish I'd have spent more money and bought a Lincoln or a Miller. This machine would be fine for some other project using heavier steel, but it doesn't have a fine control for the heat, and the low setting it has is to high for thin sheet metal. I guess this machine would be alright for a beginner learning to weld with 1/8 steel, but it just isn't good for body panels. I should have done more research and not tried to get away buying a cheap tool. how in the heck is it a MIG emphasis on the G if it is gasless? MIG is the generic term for a wire feed welder, most MIG welders can be used with a flux core wire that allows them to be used without a shielding gas. can you weld autobody panels with this welder? Yes, this welder can weld sheet metal. Per our purchasing agreement with the manufacture we are not at liberty to give out the manufacture name. These are built to our specs and we warranty these for the period of 1 years from the date purchased. How does the MIG 100 Gasless welder perform when welding rebar? &nbsp;I plan to use it for making yard art items. It will work well in that application. No, this is not designed to weld aluminum. Thank you for your question. No JEGS Performance Products 81540 Can not be converted to be used with a shielding gas. It is intended for Flux Cored wire. The Jegs MIG 100 Gasless Welder. It can be used for 18 gauge up to 1/8&quot; thick metal.